The knee, the largest joint in the body, is a hinge joint consisting of three parts. The lower end of the thigh bone — the femur, rotates on the upper end of the shin bone, the tibia, and the knee cap, or patella, which slides in a groove on the end of the femur. 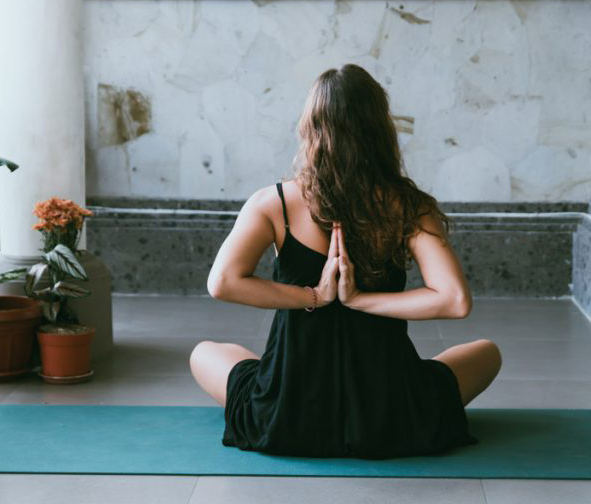 When we face challenges with our knees, it’s great to know we can take advantage of the miracle of modern knee replacement methods, but yoga offers some great ideas to help us keep our original equipment in peak condition! What do the knees really do? In order to keep our knees healthy, and recover through knee issues, we use a healing approach to our practice support optimal alignment of the knee. We stay out of the pain zone and work slowly and mindfully with our practice. Instead of striving to achieve complicated poses that compromise the knee, we modify the poses to meet us where we are, and adapt to our practice to meet us where we are. Get into waterfall pose at least once a day in order to drain the lymphatic system of the lower body. When we go upside down, we move out the old lymph and toxins that have been hanging around the nooks and crannies of the challenged areas. The lymphatic system removes natural toxins and waste products that our cells create. When we support that natural circulation by getting our legs up, we can experience a reduction in edema and swelling around the knees, and it really refreshes the legs. Enjoy the pose for anywhere from 5 minutes to 20 minutes. We think of the knees as being an isolated joint between the upper and lower legs, but the tone of the muscles, the health of the connective tissue on the soles of the feet, and how we stand on them has a major influence in the functioning and health of the knees. Stretch the feet and ankles daily, working on releasing tension in the plantar fascia and all the toes. Roll the soles of the feet out with a tennis ball and massage out all the phalanges of each toe. When standing keep the feet under the hips or just a bit wider, with the outside edges of the feet parallel and soften the knees. Bring 60% of your bodyweight back onto the heels, and 40% on the front of the feet, the metatarsals. Our chair sitting culture has compromised all our muscle and connective tissue chains, both upstream and downstream from the knees. When dealing with knee issues, a healing approach keeps us within a comfortable range of motion, while the breath helps to keep us focused on the present moment. Many of us have tight hamstrings and calves, and weak quadriceps as a result of chair sitting. To counteract that, create a daily routine of easy hamstring stretches with a belt or tie, while simultaneously strengthening and activating the quadriceps. There are several variations of this pose that allow for the stretching and strengthening the tissues of the inner and outer legs, as well as the back and side hips. These areas play a significant role in how the knees function. Enjoy standing poses with legs that are properly aligned to support optimal function of the knee joint. Perform progressively longer holds to cultivate more strength and flexibility in legs and hips, and experience the added bonus of building bone density. Many people see strong connections between thoughts and emotions and the location and type of pain. Take some quiet time to meditate and journal to surface up any emotional causes for knee issues, or thought patterns that seem to trigger a spike in pain levels. The medieval latin “genuflecto” translates literally to “I bend the knee”. Bending the knee is associated with humility, worship, reverence, or service. The author Debbie Shapiro writes in her book, The Body Speaks the Mind, that certain conditions reflect emotional patterns. She writes that where there is water on the knee, there is a holding of emotional energy. For inflammation, something or someone is making us feel irritated or angry. In the case of dislocation of the knee there is a resistance to giving way. These emotional-body connections may not have many sound scientific studies backing them up, but there is enough anecdotal evidence to support being curious about it and exploring these ideas in our own reflections. Dehydration is a common cause of joint pain, so drink at least 3 litres of room temperature water or herbal teas every day. Experiment with a whole-food, plant based anti-inflammatory diet and eliminate sugar, wheat, meat, alcohol, dairy, and processed foods for 30 days. The reduction in inflammation helps bring down pain levels. Eating this way is also very effective for weight-loss, which is a healthy way to reduce the load on our knees.